"My goal is to create wearable items for work and play that offer an interesting statement about the women who wear them." says the artisan owner of Shiny Adornments. 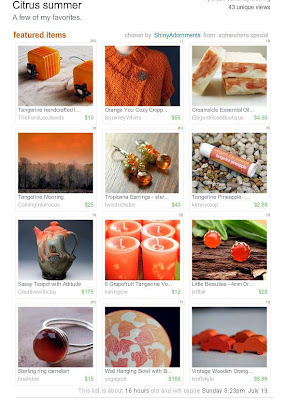 ShinyAdornments is the name of an etsy storefront full of handcrafted artisan jewelry creations. The work is made in a studio in Wichita, Kansas and it's appeal is universal. A visit to Shiny Adornments will turn up bracelets and bangles for your wrist, earrings that hoop and dangle, necklaces and the loveliest hair sticks. Makes me wish I had long hair again just so I could wear some! You will see gemstones, lamp work and other glass beads, and polymer clay all strung together with sterling silver wire and findings. 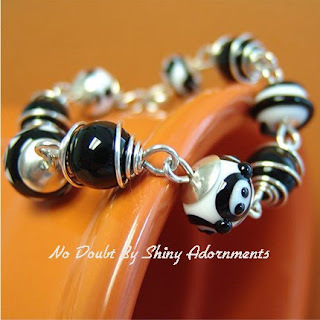 My particular favorite is a black and white bracelet accompanied by sterling silver wire that has been named No Doubt. The Artist's bio states that she finds "inspiration in the wildflowers I drove past this morning on the way to work or the suit I just bought that needs the perfect accessory or the strange dream I had last night...the materials depend on my mood..."
Shiny Adornments was kind enough to include Bonnie's vintage Lucite earrings in her recent etsy Treasury "Citrus Summer"
Thank You Shiny Adornments. We are proud to be included in your work of art. Aww, thanks very much for the profile. You're very welcome I'm sure.